The Crimean Human Rights Group has studied more than 50 administrative cases against residents of the Russian-annexed peninsula, according to a material published on the organization’s website. Nearly half of the judgments studied show signs of politically motivated prosecution. According to human rights activists, in violation of the right to freedom of expression, not only the criminal code, but also the administrative code of the Russian Federation is actively used. For example, under Art. 20.3 for the demonstration of the symbolism of Hizb ut-Tahrir, which is not prohibited in Ukraine, 12 decisions were adopted. All these cases are connected with the persecution of the Crimean Muslims. Some of them are engaged in social activities on the peninsula. The lawyer of the Crimean political prisoners Emil Kurbedinov, the Crimean Tatar activists Seytumer Seytumerov, Marlen Mustafayev, the Kulametovs family, were punished with fines of 1 thousand rubles to 12 days of arrest. Of the 12 decisions in these cases – 8 arrests and only 4 fines. “At the same time, publications with the symbolism of Hizb ut-Tahrir were mainly made before the occupation of the Crimea. Some of them did not have a large number of views and reposts, some were deleted even before the decision was passed. However, in most cases the situation ended with arrest for 5, 10 and 12 days,” reads the article. Since the beginning of the occupation, at least 22 court decisions have been adopted to punish the storage of literature, which is not prohibited in Ukraine. These are various Islamic books, Jehovah’s Witnesses literature, and anarchist books. People were fined for religious books in amounts from 1 thousand to 2 thousand rubles. But for the anarchist books Crimean residents Shestakovich and Markov were punished with 10 days of arrest. Also, anarchist Vasilchenko received 10 days of arrest for publishing the songs of the La Vida Cuesta Libertades group entitled “Black Terror” and “Goodbye Capitalism!”. Moreover, 4 fines were imposed in the Crimea under Article 20.3 for amulets of Russian Old Believers, like “Star of Inglia”, “Perunitsya” and “Sword”, which were designated as extremist symbols in the Russian Federation, but also not prohibited in Ukraine. 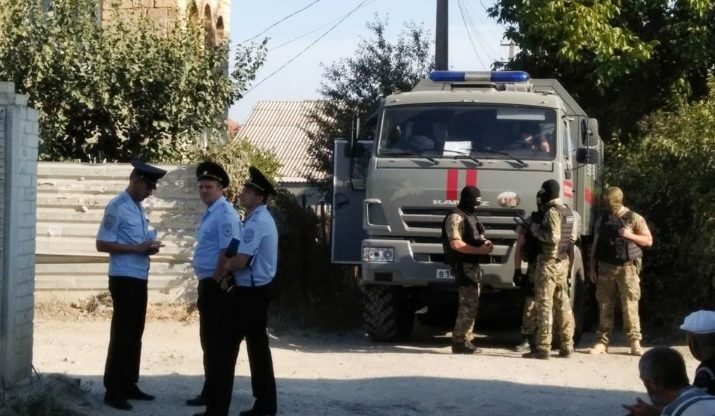 Crimeans were also fined for black and red flags in a cafe, for publishing videos with the symbols of the Azov regiment or the Right Sector flags. 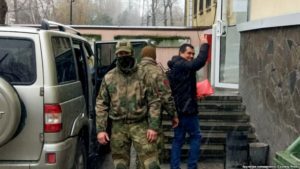 Earlier, QHA media reported that “investigators” in the annexed Crimea opened administrative proceedings against the activist of the public association Crimean Solidarity Nuri Abdureshytov. The reason for the prosecution was filming in the corridor of the “Kiev district court” of Simferopol before the trial of the lawyer Emil Kurbedinov.